IBM MobileFirst for iOS Quote & Bind provides a fast and easy way to enroll new clients for a complete end-to-end quote and bind process. Use the iPad’s camera to capture documents and enhance identification methods. The signature capabilities of the iPad provide a complete paperless solution to quote and bind prospective clients. The app's straightforward and easy-to-use dashboard streamlines the entire process and enables you to reduce the time it takes to quote and bind a customer. Gain critical mobility to reach clients outside of the office. Break away from the traditional quote & bind process, which is lengthy, involves much paperwork, and is bogged down by dual entry of information. Delivers product and coverage recommendations based upon real-time home value and customer profile information. 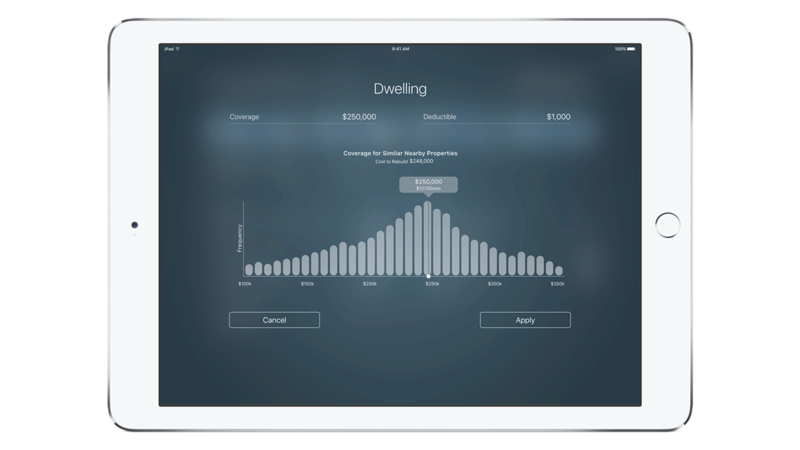 Quote & Bind uses predictive modeling to recommend and provide coverage for similar properties or properties nearby. Recommends and provides coverage based on claims patterns, weather patterns, or other factual data such as a crime report. Enables claims adjusters to manage claims anytime, anywhere. Provides C-suite presenters an interactive presentation platform. Enables underwriters to price businesses quickly and accurately.